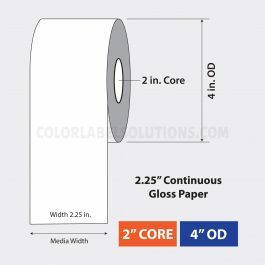 Products – Color Label Solutions, Inc. 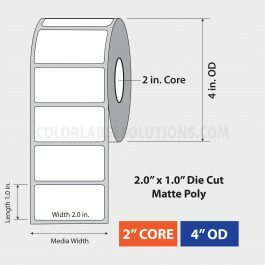 Need Great-Looking Color Labels? We Can Help. 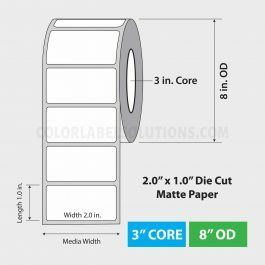 We provide everything you need to print quality, colorful labels on-demand. Color Label Solutions sells and supports color label printers and associated consumables items such as ink cartridges and labels themselves; printing software and integration services; and even label design. We offer a large selection of blank die-cut and continuous labels in multiple sizes and materials specifically formulated for use in all printers we sell. 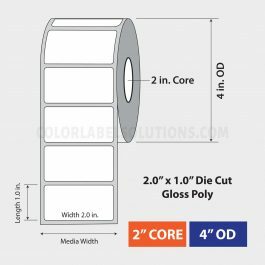 If you need a custom size label not shown in our store, please contact us by phone or email, and we will provide what you need. Contact Color Label Solutions today and find out how easily we can reduce your cost, inventory and waste of preprinted labels by moving to print-on-demand color labeling systems. You can contact us at info@colorlabelsolutions.com or call us at (855) 962-7670. 2″ x 1,020″ continuous inkjet coated gloss poly label. 2″ core, 4″ OD. 12 rolls/case. $/case. For use with Epson ColorWorks C3500. 2″ x 1″ die cut inkjet coated gloss poly label. 3″ core. 5,250/roll, 2 rolls/case. $/case. For use with Epson ColorWorks C7500G inkjet label printer. 2″ x 1″ die cut inkjet coated gloss poly label. 2″ core, 4″ OD. 900/roll; 8 rolls/case; $/case. For use with Epson ColorWorks C3500 and C3400 color label printers.